A very interesting thing has caught my eye in the photographs from the recent riots in Athens, Greece. If you look at the pictures, it very definitely says “I.M.F. GET OUT“. 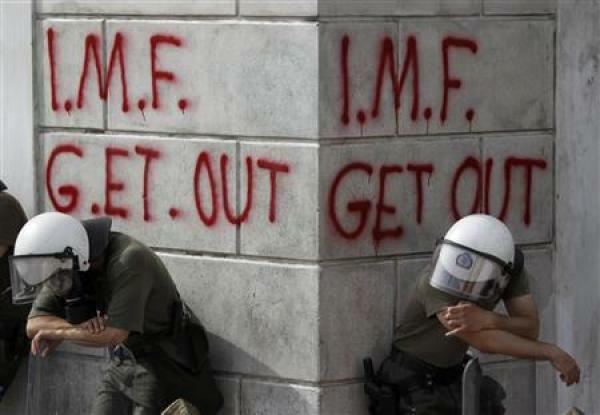 Why would demonstrators talk of IMF in Greece? Would it be possible that Greece bought into one of those IMF backed plans? If so, it would be interesting to learn a bit more about what economic development “plan” was sold to Greece. It is also quite interesting to see that Reuters does not mention IMF in their articles on Greece for some reason. Did they not see their own pictures? Eurozone troubles drove U.S. treasury debt prices higher as investors fled to havens including gold and the dollar. Seek the one who benefits, right?